Giulia Zavagno in Travel on 18 November, 2015. 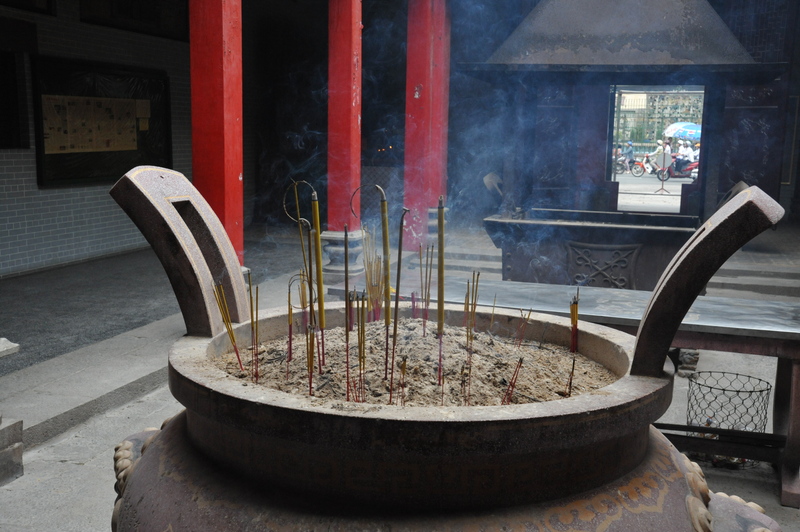 Two different worlds: incense burns slowly in a temple; traffic zooms along the street outside. Ho Chi Minh City (or known more affectionately as Saïgon/Sài Gón) has a multi-faceted charm originating from both its interesting history and the young energy. Where else can you find old French colonial buildings alongside towering skyscrapers, or delicious street food alongside never-ending motorbike traffic? Now that Ho Chi Minh City has risen in rankings in both population (almost 9 million inhabitants) and investment, expect to see a lot of commercial energy and construction as they modernize the city at a blinding pace – if your visits are six months apart, I guarantee something will have changed in the skyline! Amidst this excitement, there is also plenty of history, arts, food and relaxation to be found. So read on to plan your trip! Even though it’s tempting to visit in the summer when you can enjoy the heat, conditions may prove too intense for most visitors (as they are for locals), especially during monsoon season which compels the city into a standstill every afternoon. It is therefore advised to visit from November to March, since the temperature starts to shoot up in April and torrential rains are expected daily by May. However, the pattern has been somewhat erratic over the last few years, so it’s better to stay safe and say December to February. The temperature is much cooler (still warm however), the sunshine is pleasant, and no rains are expected at all, though if you plan on visiting nearby beaches, expect a low season atmosphere and perhaps murky water. 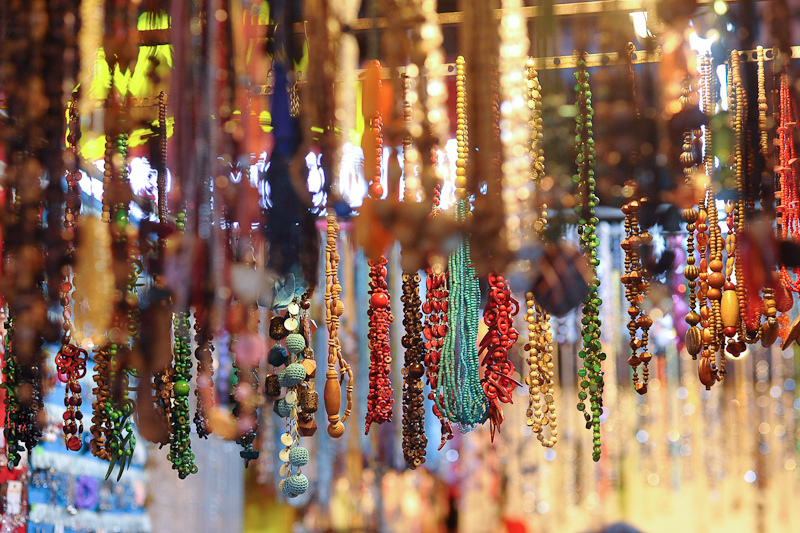 Artisan jewellery can be a unique souvenir, but you need to know how to haggle. There are numerous historical sites to visit, such as the French-style opera house, post office and church, all quite revamped in the last few years for your viewing pleasure. Ho Chi Minh City is famous for its tree-lined boulevards and parks, so after visiting the famous Reunification Palace, why not stroll in the park attached to it, or the two parks in front where university students sit, play instruments and chat in the twilight rush hours? There are also several museums, such as the War Remnants, Ho Chi Minh City and art museums to enjoy and soak in the history of the city. 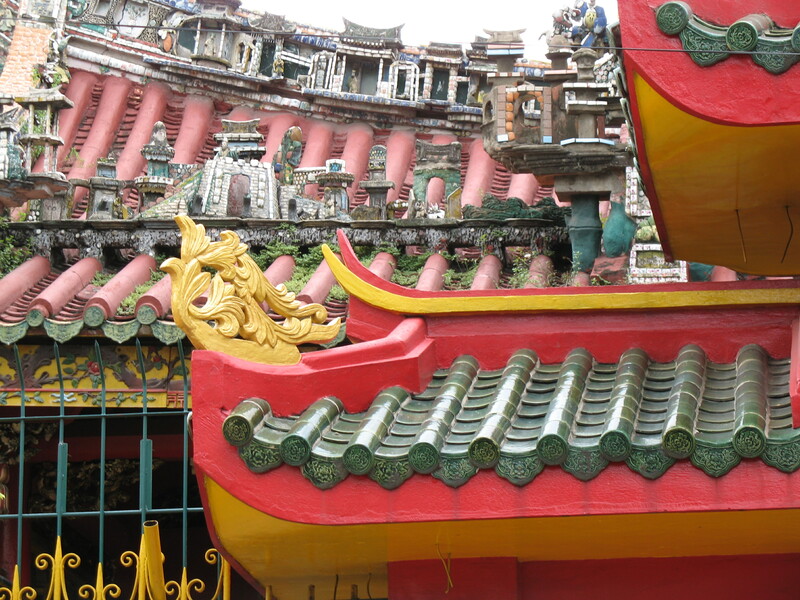 There are numerous pagodas to visit as well, such as Chua Ngoc Hoang or the Jade Emperor Pagoda or Thien Hau Pagoda, each reflecting the era they were built in, being that of Cantonese origin or dedicated seafaring goddesses (respectively). Cholon, the old Chinese quarter of the city boasts some of its best traditional food, plenty of Chinese medicinal shops and specialties found nowhere else in its markets. Speaking of markets, the legendary Cho Ben Thanh in the city centre harbours everything you could imagine. It also transforms into a night market when the sun has set. The opera house regularly showcases modern and contemporary performances in relation to Vietnamese culture and history, so that’s not one to miss. If you’re a night bird, the city has everything from top-end bars to street-side drinks with your meal. The bars at the Bitexco Financial Tower (the tallest tower in the city) afford beautiful views, or you can mingle with other backpackers in Pham Ngu Lao where most of them converge. 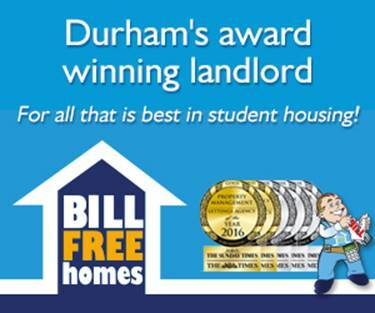 Everything there is tailored to those coming to visit cheaply, so if you’re ever in need of flight tickets, a hotel room or just company, that’s the place to be! 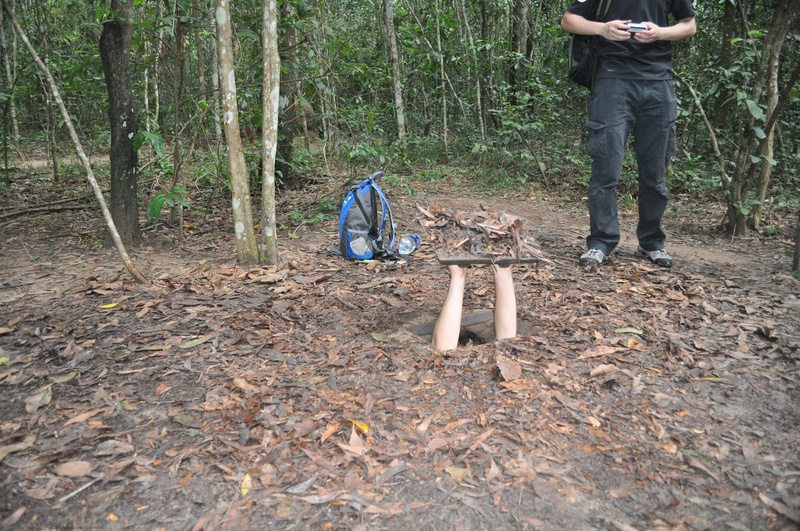 Emerging from a Cu Chi tunnel. As Ho Chi Minh City is well situated in the southeast of the country, there are several types of day trips one could take. The first would be down to the Mekong delta or the mangroves for the day. For the Mekong Delta, the city of Can Tho hosts a popular and varied floating market, complete with meals to be made, sold and eaten on boats, fruit vending and plenty of interesting personalities on the way. It’s open in the early hours usually, so you’ll want to depart early to get the best produce or sense of the energy! If you’re looking for a more relaxed way to enjoy the massive Mekong river and its tributaries, a mangrove excursion could be just your thing! Go to a more secluded location, such Can Gio national park, where you can step into a canoe and be motored around the snaking rivers and fanned upon with palms as the guides explain the importance of the region and its history during the Vietnamese civil war. As an added bonus, this national park boasts troops of long-tailed monkeys and a crocodile pond, to intrigue the naturalist in you. History buffs might enjoy a trip to the Cu Chi Tunnels, the site of Viet Cong resistance during the war. The Viet Cong dug an immense network of tunnels (almost 200km in length) under the forest floor in order to escape American and Australian troops, as well to reconvene, store supplies and sometimes to live underground. These tunnels have been enlarged for modern day visitors, but still remain tight and dark so this is not recommended for the claustrophobic. Guides will explain the many ways traps were made (that’s why it’s important to stay on the trail. It is not known how many traps remain un-triggered), sometimes covered by leaves, or a wall of bamboo spikes behind a door and so on. There is also a gun-firing range nearby for those who are itching to try their hand at some shooting. Finally, the last day trip I recommend is to the fruit producing regions in the South. Here, you can sample tropical fruits, enjoy other local delicacies, and stroll through sleepy villages resting in the afternoon heat. A relaxed and delicious day for any foodie. Many of these trips are highly customizable or can come in packages, available through the many tour companies situated in Ho Chi Minh City.